Add Affiliate Links to WordPress Sites - Ready for Commission? The two major ways to make money out of your blog, when you don’t sell your own products, is either through online ads or affiliate programs. This tutorial series, Online Income 101, is all about generating revenue through affiliate marketing and to do this, you need to add affiliate links to WordPress sites (your blog site). Let’s learn how to do it in this lesson. Once your new blog site starts filling up with good content, the next step is to join the affiliate program and obtain unique affiliate links assigned to your account. Before we get into today’s lesson, here are our previous lessons. Go to the company’s website within your niche that has an affiliate program. You should have found at least one in the process of Lesson 1. Sign up for their program by providing the necessary information about your website. Some affiliate programs do check your website to approve membership, so I recommend you have some content created by the time you go sign up. Even if your site did not get approved by the company you wished to join, don’t feel discouraged. You can try affiliate networks that many merchants have partnerships with. There is always Amazon as well. I explained in this blog how to join Amazon Associates. On my new niche site, PurePinkSalt.com, I am going to promote Himalayan salt products such as salt lamps, candle holders and cooking salt. The first place I checked was Amazon, of course, and as I expected they have a large variety of Himalayan salt products. Nothing beats the trust people have in this gigantic shopping platform, so I will definitely link some of my blog posts to products at Amazon. I also found a Himalayan salt online shop within one of the major affiliate networks, ShareASale, where I am already an affiliate. All I had to was add the shop to my merchant list. One thing I would like to note, though, is that if you are planning to promote a shop that you have no experience as a customer, first purchase something from the shop and see if you liked the experience. You should never recommend anything that you are not sure of on your website. Through your journey as an affiliate marketer, keep this always in mind: You recommend things because you know they serve your audience well. 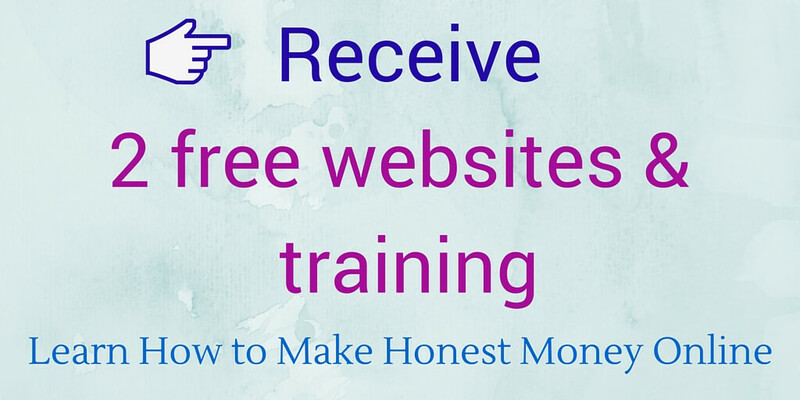 This is the only way that your visitors come to trust your website and your recommendations. If Shop A offers you a higher commission than Shop B, but you know that your audience would benefit better from Shop B than Shop A, promote Shop B. Your earnings per unit may be smaller in the beginning. However, in the long run, it will lead you to a greater success. Trust is everything in online business. You don’t want to do anything to ruin it because once you lose the trust from your audience, it is extremely hard to regain it. Only promote what you feel confident to promote. This is the fundamental key to your affiliate marketing success. Once you are accepted as an affiliate, the company will grant you access to your back office where all the account/sales information is available for you. This is where you find your affiliate links in various forms. Let me show you the back office of ShareASale.com for example. To obtain my own affiliate links, I need to click LINKS > Get a Link/Banner. Then they take me to the page where all the short links that I can embed within the text and long HTML codes for a banner, like the one you see below, are located. All I did was copy the code and then added it to the text editor of this blog page. These codes have my unique account numbers included, so anyone who clicks through these links/banners is identified as a customer who I have brought to the business. If a purchase was made, I will earn a commission. The affiliate program you’ve joined should offer you links you need in a similar manner. Below I’ll explain how to add banners and affiliate links to WordPress sites. The beauty of Amazon.com is that, for you to earn a commission, the visitor you sent does not have to buy the particular product you promote. As long as they purchase something at Amazon within 24 hours after you sent them, you will still earn the commission. Read more about Amazon Associates in this post. Here is a text link and an image link I added to my article about Himalayan salt candle holders. I’ll walk you through how I added these links. Once you have signed up with Amazon Associates, every time you log into Amazon even just to shop, the bar called SiteStripe will appear on top of the page as you see in the image below. This is a new feature Amazon has implemented recently. 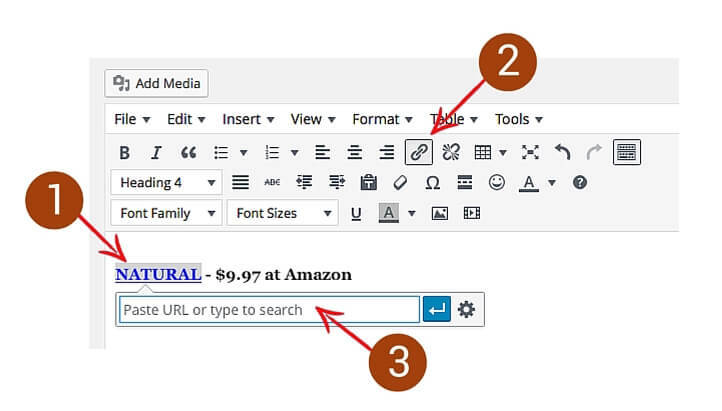 With the SiteStripe bar, you can create links directly from the product page at Amazon.com without visiting your affiliate page, Amazon Associate Central. Go find the product you want to promote on your website. When you find the product, click on “Text” on the SiteStripe Bar. It will automatically provide you the link code for the particular product. Copy that code. For an image link, you click on “Image” on the SiteStripe bar on the product page of your choice. Select the size of the image by checking small, medium or large. Copy the HTML code at the very bottom of the popup window. You are going to paste this onto your blog. Just remember. You have to paste the HTML code for an image link within Text Editor, not Visual Editor. If you added the code within the Visual Editor, it wouldn’t appear in the final draft of your blog. Click on the tab “Text” at upper right corner of your draft space, and be sure to place the HTML code there. To make sure if the image is properly installed within the blog, you can switch back to Visual Editor and check. 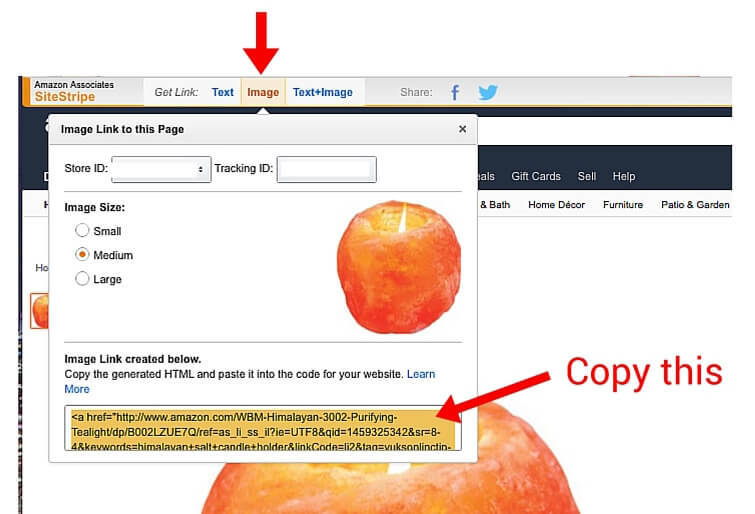 Amazon also provides an ad link (text + image) that I am sure you’ve seen on many sites. I am not a big fan of this but if you want to utilize it on your website, you click on “Text & Image” on the SiteStripe bar. The rest of the procedure is the same as you did to add Image links. I recommended several products on my blog post about Himalayan salt candle holders. I listed each product with its image and text link from Amazon. Feel free to view how the page turned out and let me know what you think. I welcome any feedback! What Makes People Click the Links? 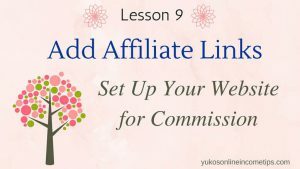 Now you know how to add affiliate links to WordPress sites and your blog site is set up for generating commissions. If a visitor clicks through one of the links you embedded and completes a purchase, you will earn a commission through your blog site. This is a technical aspect of affiliate marketing, and it is not too hard. What matters more is to understand what makes your audience click the links within your content. The information you share on your website must be worthwhile and valuable enough for readers to trust you. Until they trust you, they are not going to click any links that you have placed on your site. Ironically, while your major focus is on making money, you won’t make much money. Like in the example earlier, once you shift the focus on choosing an affiliate program to join based on the quality of products or service rather than the commission rate they provide, you are on the path to a successful affiliate marketer. I will share in a separate article the tips of becoming successful in affiliate marketing. This is Lesson 9 out of 10 lessons in the tutorial series, Online Income 101. You’ve come so far and achieved so much. Congratulations! We have one more lesson to go for this beginner’s course, Online Income 101. Give yourself a pat on the back, you are almost there! As always, if you have any comments or questions, feel free to leave them below. See you in our last lesson! 4 Comments on "Add Affiliate Links to WordPress – Ready For Commission?" Great post! A very informative and a step by step walk through guide on internet marketing. It is definitely a useful site for newbies. I have tried online surveys before. It is not only a very slow process of earning money, but also have to provide a lot of personal details. Online Ads is easy money but you need a huge amount of traffic to your site. Affiliate marketing requires effort in content writing and reviewing products but the potentials are great. Thanks for commenting. Yes, I built this website to help newbies to start their online business and earning income online. 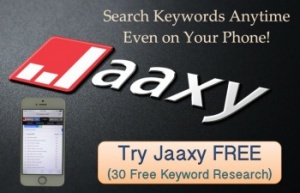 I have tried survey sites and didn’t like any except one site, which you still need to invest time for small earnings. It’s called Swagbucks and you don’t necessarily have to provide personal information. Check out if you are interested. I agree with you. If the goal is to earn passive income online, affiliate marketing is the way to go. It does require your hard work but down the road, it will be well worth it. It is my hope that Online Income 101 helps my audience to start out with affiliate marketing! Wow, your website always looks better and better Yuko! I have put affiliate links to my website but I have never earned anything yet (still on my way). How can I be 100% sure that my affiliate links are working? Is there any kind of bug that can destroy the affiliate links? I’m hoping that my affiliate links work but I wouldn’t like to trust only in the hope but to be 100% sure that they are working. Do you have some tips to check it? My affiliate links seem to be all working fine. If you want to check if your links are working, you can click on them and see they take you to the product site. Or you can ask family and friend to click them as a test. I always ask my husband to click my new links from his computer just to make sure. Also, many affiliate programs such as Amazon and ShereASale provide a member page where you as an affiliate can check stats, commission and the number of clicks each day. If the number stays zero clicks for a few months even though you’ve been creating content on your website, you may want to contact the merchant. Your audience need to trust you to click on your affiliate links, and trust takes the time to build. You’re going to get there so be patient with yourself. Report back when you had the first commission. I would love to hear a great news!